Now you can finally make a grilled boneless chicken breast that's not dried out like an old slipper! 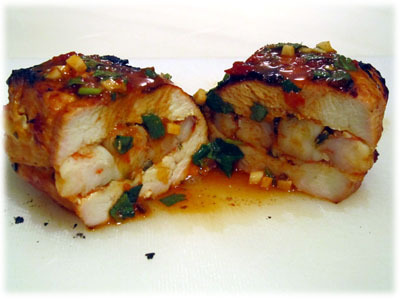 While boneless chicken breast recipes are one of the most popular for the grill they're actually one of the hardest for people to cook just right. Leave them on just a little too long and it's game over. Not even Rover's going to eat that one. The reall secret to this chicken breast not drying out is the cream cheese and onion you "stuff" it with before wrapping them in bacon. 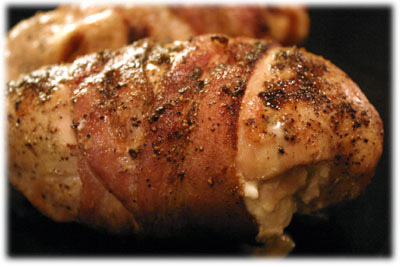 The cream cheese keeps the breasts moist from the inside out while the bacon bastes the meat as it cooks. 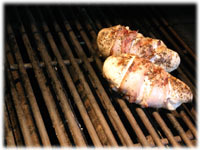 Give this recipe a try if you're looking to grill boneless chicken without it drying out on you. 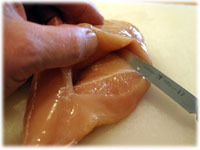 Lay a boneless chicken breast flat on a cutting surface and carefully cut a pocket into the side of it with a sharp knife. Try not to cut all the way through with the knife or the innards will leak out. Spoon 1 tablespoon of the cream cheese into the pocket and smear it around to fill the inside of the boneless breast. Spoon 1 tablespoon of the dried onion flakes into the pocket. 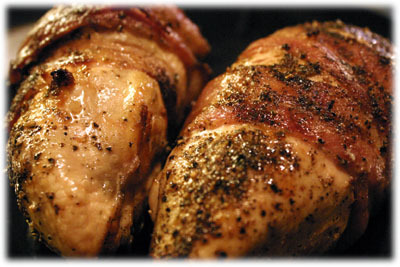 Wrap each stuffed breast with 2 strips of uncooked bacon. If you need to you can secure the bacon with a toothpick, just remember to remove them before serving. 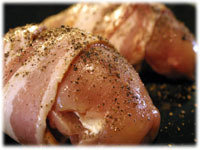 Rub each boneless breast with a little olive oil and sprinkle with crushed black pepper. Clean and oil the grates of your grill and preheat to 525F - 550F. Set up one part of your grill for direct heat cooking and keep another area reserved for indirect cooking (unlit). 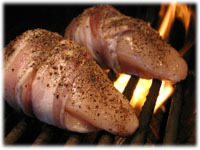 When the grill's at cooking temperature place the boneless chicken breast recipe on the grill over direct heat and close the lid. After several minutes flip each breast over and leave for another 3 minutes to sear the bacon. Move the chicken off the direct heat and over to the indirect heat cooking area. Leave the pieces for about 8 minutes and flip them once and leave for another 8 minutes. When they've reached an internal temperature of 165F (in the meat, not the cream cheese) then remove each breast from the grill and cover with aluminum foil for about 5 minutes.